Most electronics theft is a crime of opportunity. It only takes a second to quickly steal an unprotected notebook computer from a desk or table. Millions of dollars of hardware and billions of invaluable data are stolen and unrecovered each year. 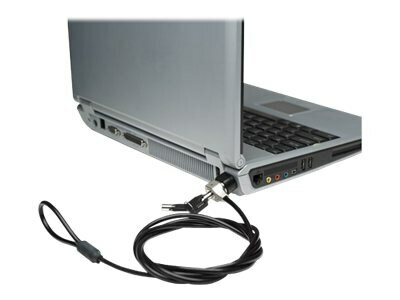 The Manhattan Mobile Security Lock with its key lock (includes two keys) helps guard notebook computers, flat panel displays, projectors, cameras and other valuable portable electronics from theft. Using the built-in security slot, its steel cable and all-metal construction when secured to a permanent object help resist tampering to discourage any would-be thieves. Easily installed, the Manhattan Mobile Security Lock makes an ideal accessory for home, office, school, travel and other locations where expensive electronics are at risk. A durable PVC coating helps protect electronics, furniture and other objects from scratches and damage.